What do I do after homeschooling’s over? During my years as a homeschool mom, from time to time I’d find myself looking for good side jobs to make some extra money. You know, the “side hustle”: something to do at home to supplement the family income allowing me to stay home with the kids. But I’m at that point of time – and you may be facing this, too – when a whole ‘nother season is approaching. 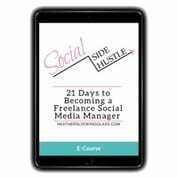 I no longer find myself looking for a side hustle. I’m looking for a “real job”…or better yet, career. be older (or “more mature”). 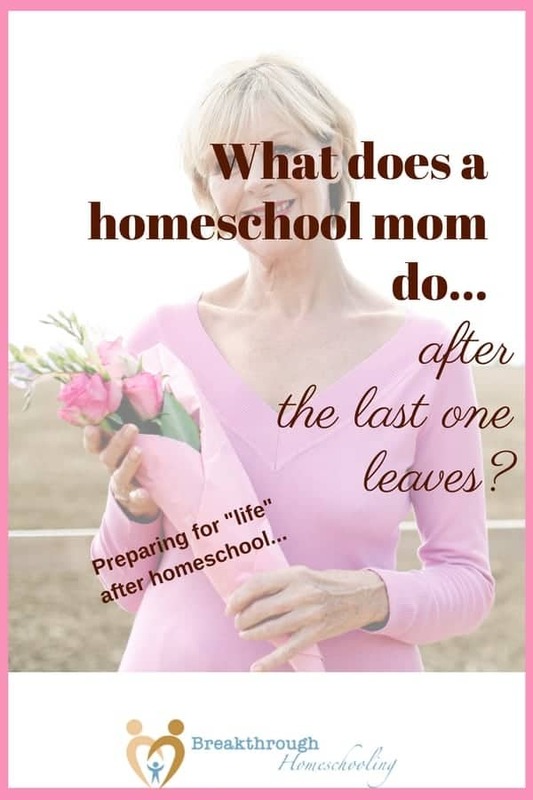 So what’s there for a “retired homeschool mom” to do? One thing is for sure: even with the best of intentions and the best-laid plans, none of us know for certain how long we’ll be homeschooling. In my own experience, we started 2o+ years ago with the full intention to homeschool through elementary and middle school only and ended up graduating 4 of our 5 kiddos (so far). Although my goal/dream is to finish up with #5 (who is starting high school this fall), I’m wise enough to understand that life could very easily through us a curveball or two in the next few years. The primary bread winner’s job loss, critical health issues, a long-distance move, and other life upheavals may diminish homeschooling as a feasible option. (Although I’m well aware that sometimes those same events make homeschooling necessary and preferred!) But life doesn’t always go as we’d like or plan. 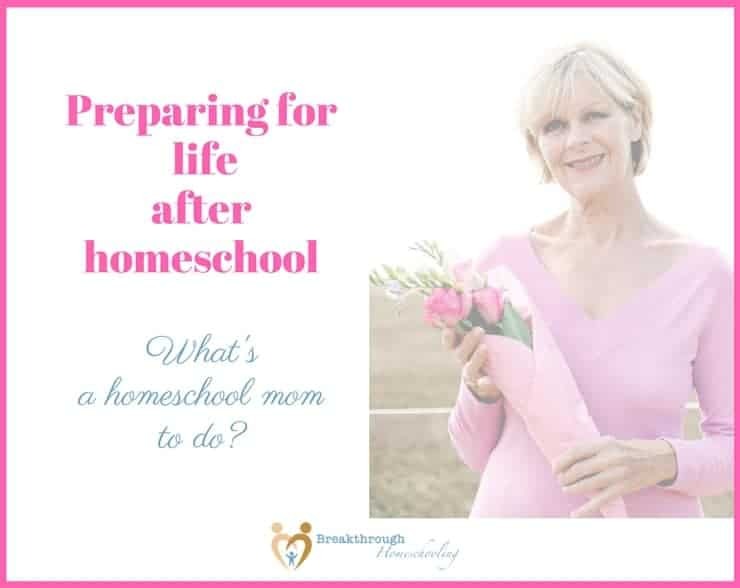 With that in mind, let me encourage you to be a proactive homeschool mom who is not only preparing her own brood to fly out into the world but is ready to do so as well! OK, I’ll admit this sounds a bit silly. And actually, it was my husband who first encouraged me to do this when a possible part-time job was presented to me. At the time, I had been homeschooling for about 15 years, and I was feeling somewhat down about being “only” a homeschool mom for so long. I had been reminiscing about the career I’d left just after kiddo #1’s birth, and wondering what skills I’d have (left) after being out of the workforce for so many years. Although I knew (intellectually) that I’m a smart, capable adult…I wasn’t really feeling it. So this activity was an exercise in reviewing just how much I had accomplished over time. What kind of skills I’d developed or strengthened; what kind of jobs and responsibilities I’d had, both in and out of our home, domestic and educational and “commercial”. Similar to the first time we’d done a homeschool transcript with kiddo #1, this opened my eyes and heart to my own abilities as a home educator and the personal strengths that can be applied in the greater workforce. As our kids get older, it serves them well for us to teach them how to learn independently and allow them to do so. That means that at the same time, we’ll have a bit more time to ourselves – even if we have to be diligent about scheduling it. Of course, I don’t mean you have to spend a bundle and go back to college (although if you DO want to do that, do your research – there are scholarship and grant funds out there for moms who are returning to school!). One of the upsides to this age of technology is that you can find courses to study online and at your own pace. This allows you to take some time to explore and discover skills or jobs that you might want to dig deeper into down the road. Alison.com is a great resource, too, that contains over 1000 high-quality courses available across 9 distinct categories, all absolutely free to complete. All their courses are self-paced and have been designed by subject matter experts, to give you an interactive and enriched learning experience. Peruse their listings and see if anything strikes your fancy! 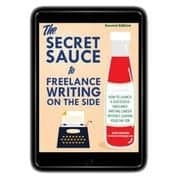 Freelance writing – This book will teach you how to plan your business, how to get funding if necessary, and how to land clients. 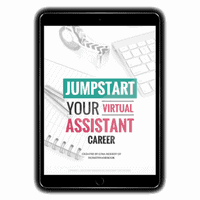 Virtual Assistant – This 21-page workbook contains five lessons that will give you a step-by-step jumpstart towards starting a new virtual assistance business from scratch. Try out the first lesson for free using this link. Photography, work-at-home, and even crafting (learn a new skill or improve one you already have to jumpstart a “handmade” career!). So what are YOU gonna do when you “retire” as a homeschool mom? But tell me, I’m curious: what ARE your plans or dreams for when you finish homeschooling…whenever that may be!? The Ultimate Bundles - Here's to Healthy Meal Planning this year! Free summer learning from "the Co-op"!